Everything around us is made of 'stuff', from planets, to books, to our own bodies. Whatever it is, we call it matter or material substance. It is solid; it has mass. But what is matter, exactly? We are taught in school that matter is not continuous, but discrete. As a few of the philosophers of ancient Greece once speculated, nearly two and a half thousand years ago, matter comes in 'lumps', and science has relentlessly peeled away successive layers of matter toreveal its ultimate constituents. Surely, we can't keep doing this indefinitely. We imagine that we should eventually run up against some kind of ultimately fundamental, indivisible type of stuff, the building blocks from which everything in the Universe is made. The English physicist Paul Dirac called this 'the dream of philosophers'. But science has discovered that the foundations of our Universe are not as solid or as certain and dependable as we might have once imagined. They are instead built from ghosts and phantoms, of apeculiar quantum kind. And, at some point on this exciting journey of scientific discovery, we lost our grip on the reassuringly familiar concept of mass. How did this happen? How did the answers to our questions become so complicated and so difficult to comprehend? 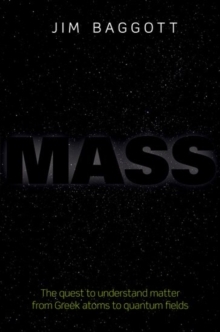 In Mass Jim Baggott explains how we come to find ourselves here, confronted by a very different understanding of the nature of matter, the origin of mass, and its implications for our understanding of the material world. Ranging from the Greek philosophers Leucippus and Democritus, and their theories of atoms and void, to the development of quantum field theory and thediscovery of a Higgs boson-like particle, he explores our changing understanding of the nature of matter, and the fundamental related concept of mass.